Achilles Tendonitis is an injury commonly seen in athletes participating in sports that involve sudden changes in speed when sprinting, running or jumping like football, baseball, basketball, tennis, and soccer. The achilles tendon connects your heel to your calf and helps with movement and flexing of the foot. Achilles Tendonitis is inflammation of the achilles tendon and is often caused by overuse, increasing activity too quickly, tight calf muscles, or flat feet. If you are injured, the area on the back of your foot above your heel may hurt, your achilles may feel tender or tight, and it might be difficult for you to move your foot. Severe injuries can involve the rupture of your achilles tendon, you might hear and feel a pop when this occurs and you may experience severe pain. Aside from the typical rest, ice, compression and elevation for your foot treatment, wearing a brace to support your achilles tendon and applying a compression sleeve to your calf can help alleviate pain. 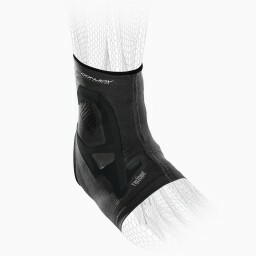 An ankle brace like the Trizone Ankle offers the same benefits of taping you might consider for applying pressure and improving arch support. Adding foam rolling and stretching exercises for your calves to your workout, cool-down or warm-up is one of the best ways athletes can help prevent achilles tendonitis.